Register now for the Oct. 8 conference. Webster University is hosting the fifth annual Sustainability Conference on Saturday, Oct. 8, exploring the meaning of sustainability and the impact of the individual. The event will host panels, breakout sessions and presentations featuring local food providers, environmental professionals, urban ecology experts, student activists and other local sustainability champions. The conference will kick off with keynote speaker Catherine Werner, the first Sustainability Director for the City of St. Louis. The conference will provide a dynamic atmosphere where individuals from all walks of life can gather to uncover sustainability’s past, present and future. 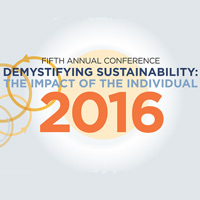 View the conference agenda and register online at webster.edu/sustainability/conference. For questions or comments, contact Kelsey Wingo at kelseywingo07@webster.edu.